The other day on a whim, completely bored with my kids’ bathroom, I decided it needed a little makeover that would give it the refresh it was lacking. Since it was such an impulse thought, two things: 1.) I ran into the few chains of stores that are all in the same shopping center to make the trip super efficient and the closest shelf to what I had in mind ran for $59 a piece. 2.) Not overly thrilled with the price since I needed two of them and the fact that they weren’t exactly what I pictured anyway, I headed to my local Home Depot and in my haste, didn’t think ahead of time about posting this here, therefore, there are no before photos and there are no in-the-making photos. Just some really happy photos of very inexpensive and easy-to-achieve results. So, here are the supplies and measurements and instructions, including the price for materials, which brought my total spending for two shelves to $34! Sand the corners and edges of your two pieces of cut wood. Stain each board evenly and let dry for 24 hours. After deciding what side you want facing up and down, place the boards against a flush portion of the wall. I spaced my brackets 3 inches from the outside of the board. With the brackets on my newly stained wood and the other half sitting flush against the wall I made the appropriate pencil marks needed to ensure each bracket was bolted perfectly in place. After centering the shelves evenly between the mirror and my shower I put soft pencil lines to help guide me when it was time to screw my shelf to the wall. I worked with my husband in placing the brackets on the wall. 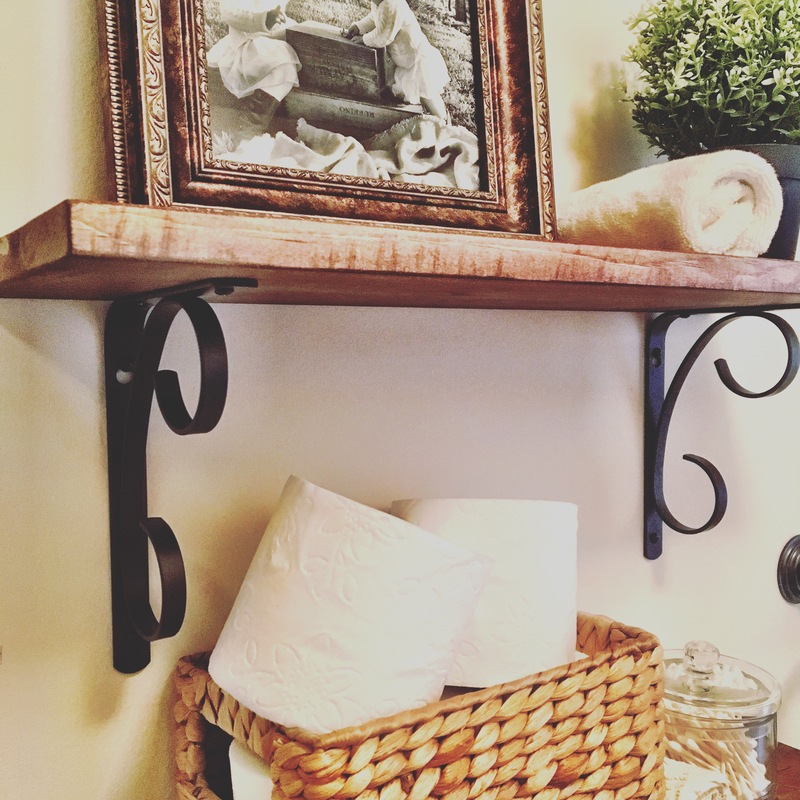 Once you have the two brackets completely screwed into your stained shelf, place them up against the wall with a level on top. If you plan on putting anything on the shelves your going to need a relatively level surface. With my husband holding the shelves completely level and in place, I marked the holes in the brackets to leave pencil marks on my wall where I would put the final screws and secure the shelf in it’s final resting place. Hold a small garbage can underneath the drill when you use the tool to screw the brackets into the wall. This way you catch the bits of debris before they hit your floor and create a mess. 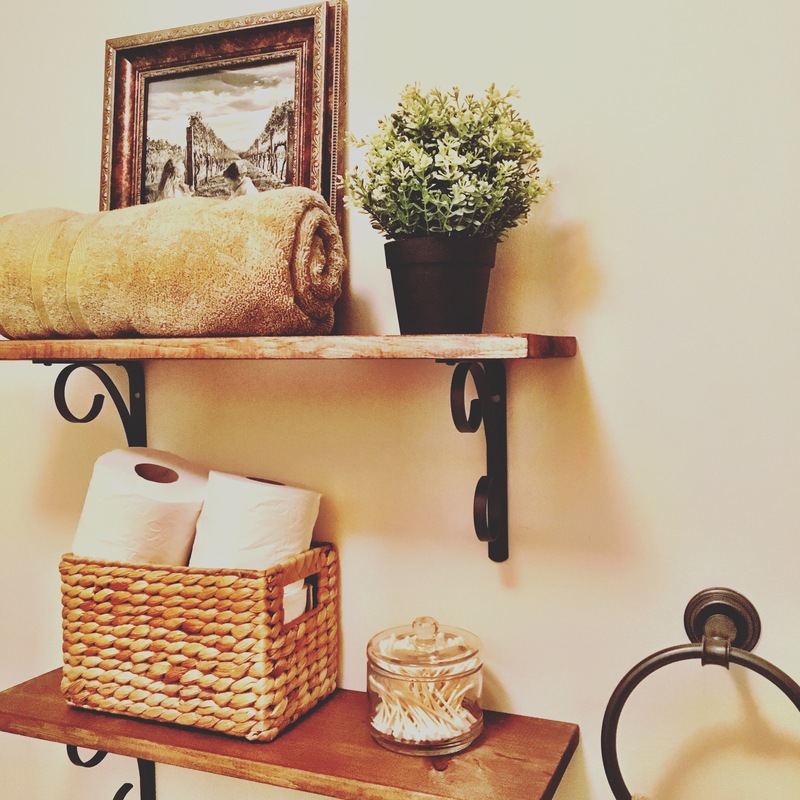 Not only did this update and refresh the look of this bathroom, but a pop of green in the faux plant helped liven up the space. It gave the room a central focus away from the bath toys that take up my girls’ tub and made the room feel more polished. With added room, I was able to store things like a few extra wash cloths and some rolls of toilet paper, so those things are now more easily accessible and more space is freed up in the cabinet space below the sink. Happy scheming, crafting and building! And organizing! Smoothies are the easiest way to get all of the fruits and veggies you should consume in one day. And as an added bonus, they are usually delicious and convenient as breakfast or for a nutritious snack during the day. I am constantly searching for new recipes and while away for the holidays, we found our now favorite tea shop that offered a ton of different juices and smoothies. Once we narrowed down some of the ones we liked best, I came home and tried to mimic those as closely as I could. Although I didn’t have some of the seeds and juices they used on hand at home, I replicated the rest of the ingredients and the results were amazing. 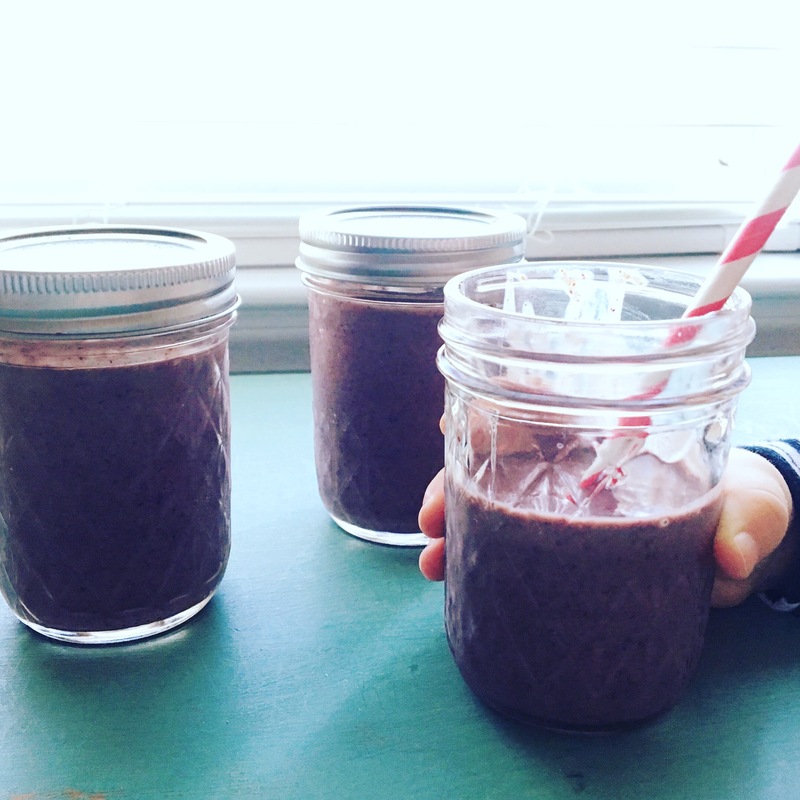 This is currently the most requested smoothie in my household and I usually have to make another batch to make sure I get a glass for myself, too. As with all smoothies that my family loves, I make about four small servings of two different kinds of smoothies at night and the next day our fridge is stocked with ready-to-go, perfect portions that last all week and are super helpful on busy mornings or when I need to grab something healthy as I head out the door. Here is the recipe for our current favorite combination this week! Blend and serve immediately or store in the fridge in air-tight glass jars for best results for up to five days.